And I am loving it! Less snow every day is a real blessing. I don’t know how long it will take to get clear ground back, but I am cheering for it in a big way. We had to go for some hay today, and those bales definitely hurt (compressed Canadian hay, 2nd cut, 60-75 pounders). But we need to stockpile some as the season is coming to an end and I don’t know when the local folk will be able to start making hay. Probably July, the way things are going. And to top it off, John is having hand surgery next Tuesday, so we need to have things in order before then as I will have no help for awhile. 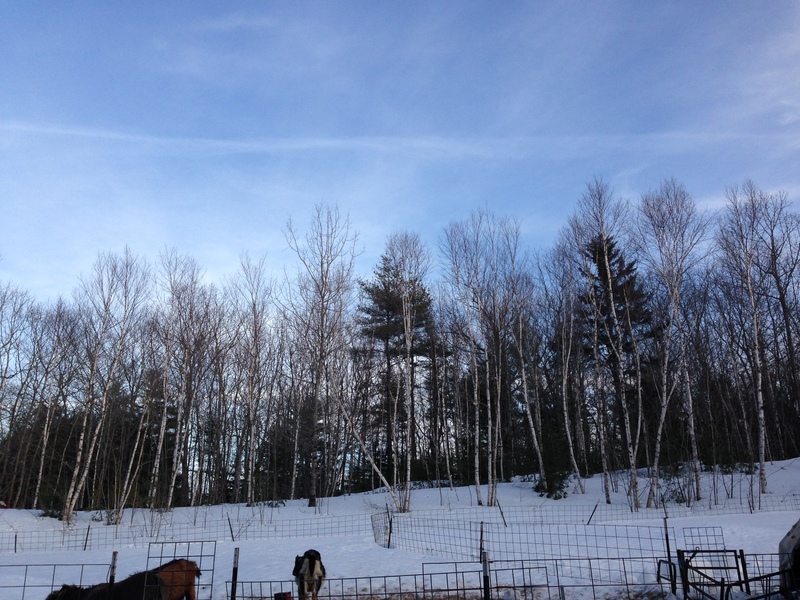 The day was beautiful, and we were able to take it easy and unload fairly leisurely. 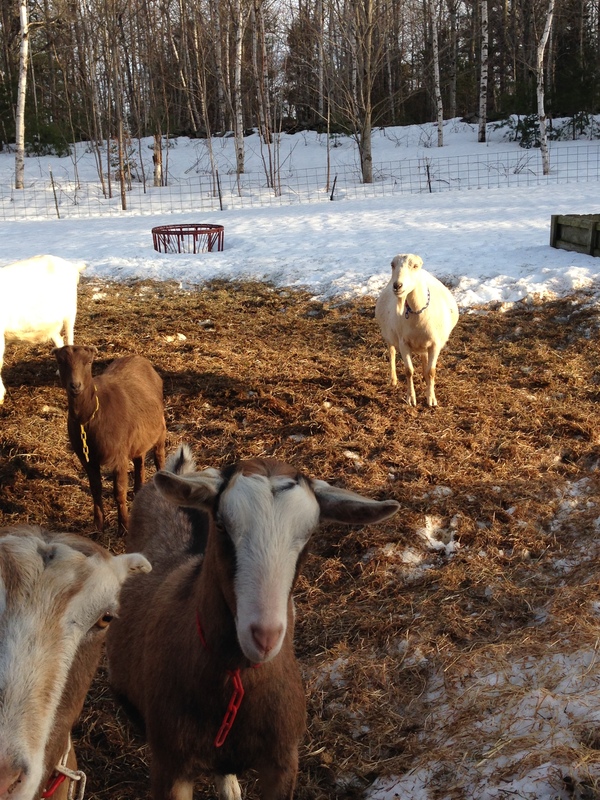 And, I was finally able to get Henry back into the boys’ side of the paddocks. I fixed up the gap in the fence last evening and am hoping that he does not find another chink in the setup. And so it goes. The twilight was spectacular tonight as I was hauling water. Another day closer to the warmer weather! Hmmm. Just who is that at the feeder??? (Black and white with his back to us…). Marigold is not impressed! I can’t believe it has taken one of the bucks all winter to realize that the doorway to Nirvana, (aka being with the girls), was open all the time. He figured it out about 36 hours ago. Henry, our almost-year-old-buckling, realized that the window was open to the girls’ side of the paddocks, and he could get through! I found him in there two nights ago, but by the end of chore time he had gone back in with Bagels and Jingle the Donkey. But alas, the next morning he was in with the girls, waiting for the grain (the boys only get grained once a day in the afternoon, but the girls get grain both morning and afternoon). OMG it’s a boy!!! Henry, the black and white buck. What a hunk! And so it has gone. He comes in, he goes out, he comes in, he goes out. 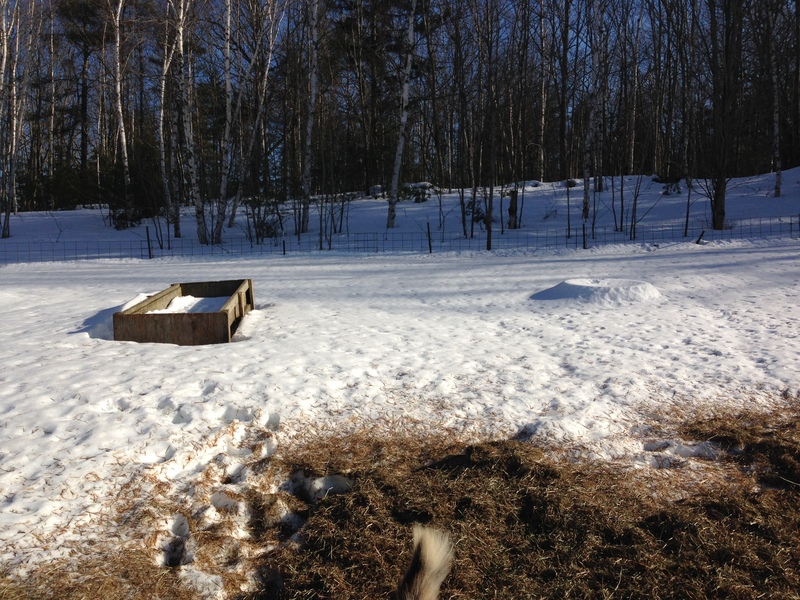 John has to make me a block on the end of the greenhouse where the snow is so high (and now so icy and stable) that he can just jump right in. 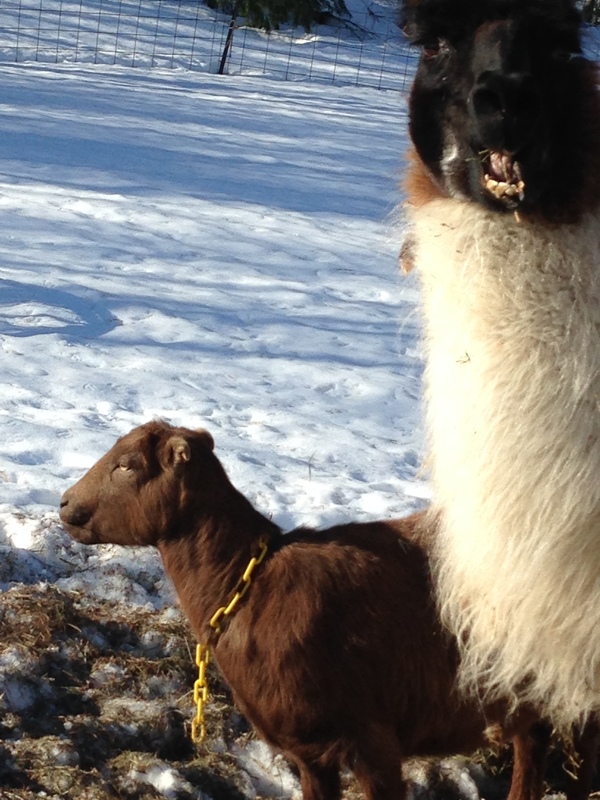 He has a bell on his collar and a very distinctive bleat. 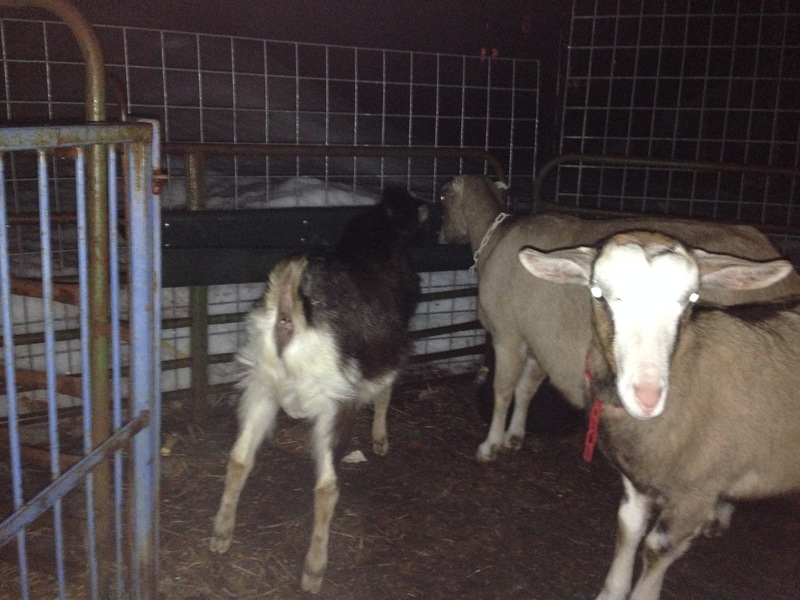 Before I even got up the driveway this morning I could hear him, and he wasn’t as close as usual, in the boy pen. Except that it won’t quit haunting us! The giant mountains of snow are going to take forever to go away. I foresee lumps of snow everywhere into July! 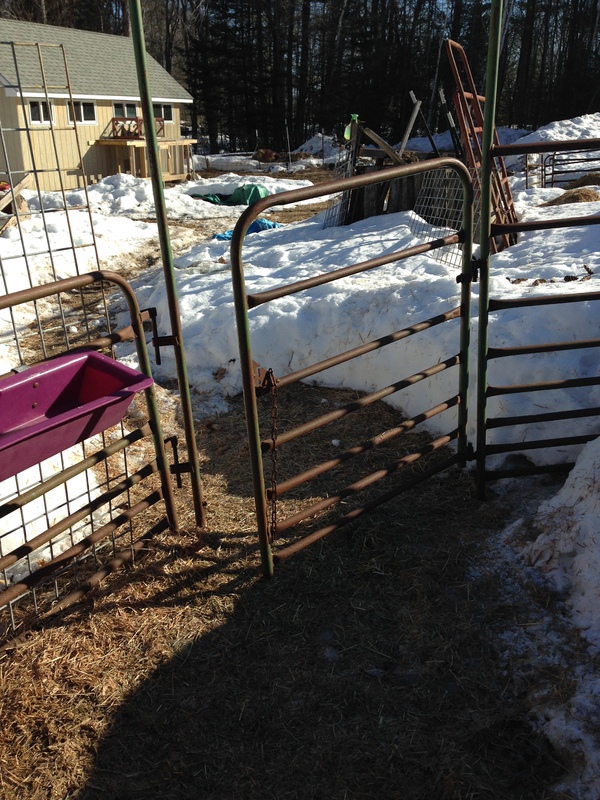 Yesterday I got home from school earlier than usual and after feeding all the critters I decided I needed to get the snow and ice off the far side of the greenhouse the goats are using for shelter. The sunny side of the greenhouse. One would presume that the sun would take care of that, but as the snow melts, it pools in the slack of the tarp (a replacement tarp that doesn’t fit quite right). 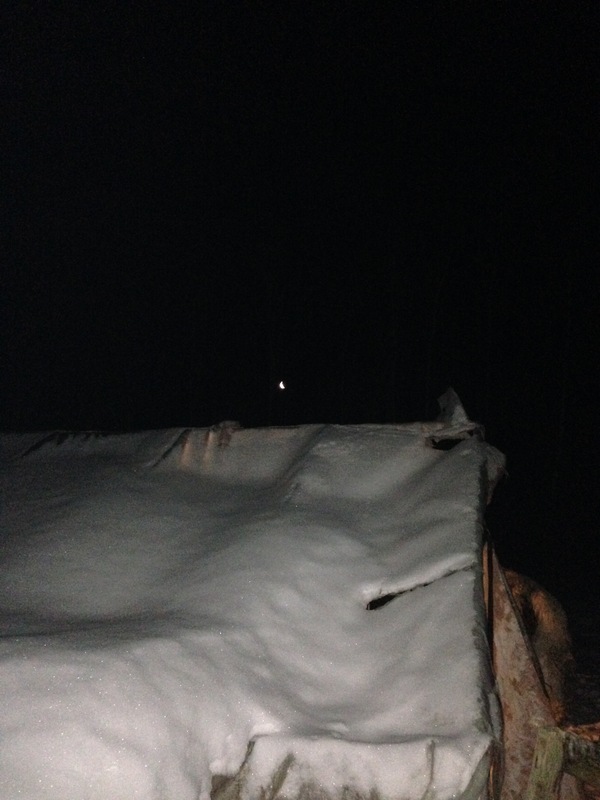 then at night it freezes and makes a gigundas ice cube that pulls the tarp down. 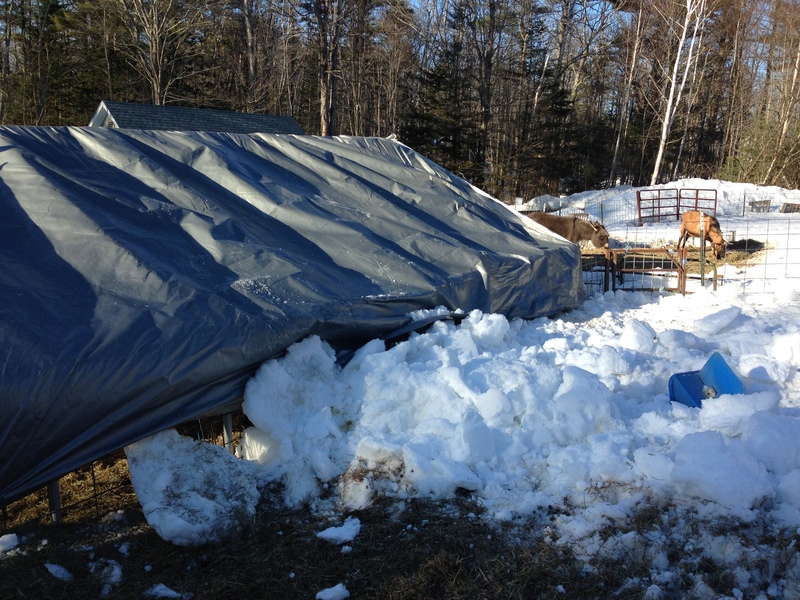 I was standing on a pile of icy snow shoveling gently so that I didn’t hurt the tarp, and did my share of falling over. And then I lucked out: a *young* family friend came down for a visit and really helped me out. Phew! The north side of the greenhouse. 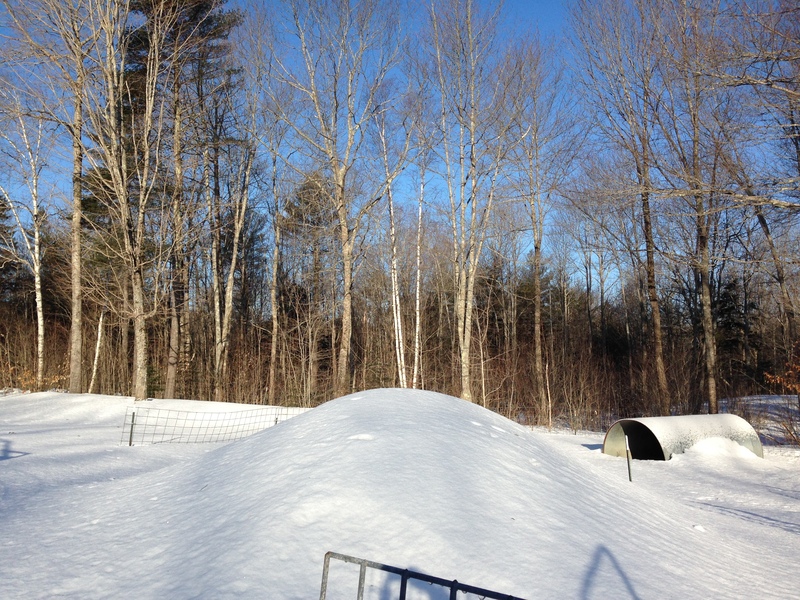 Still a snow cave. 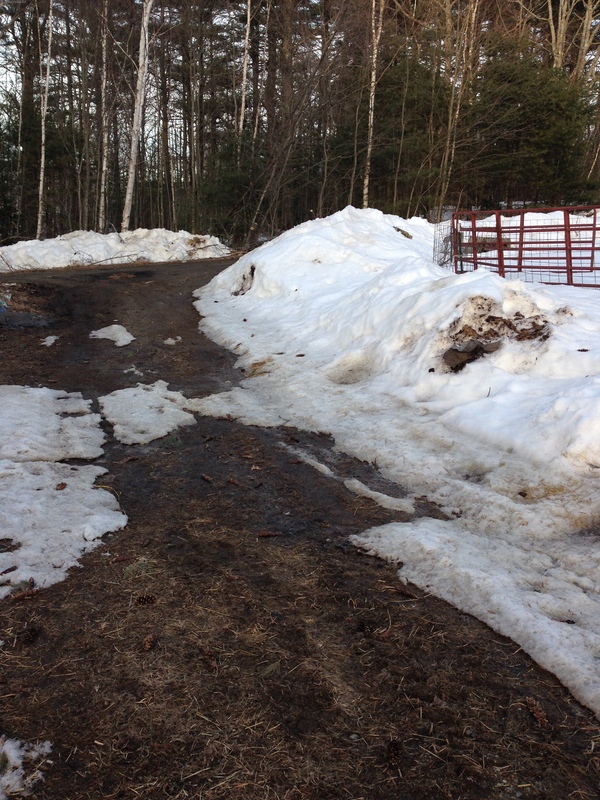 So one side is cleared of the ice and snow, the other side remains covered. I am hoping that I can get that taken care of this weekend. Not yet. That tantalizing thought of warmer days never materializes for us in northern New England right on the day, but hope never dies! 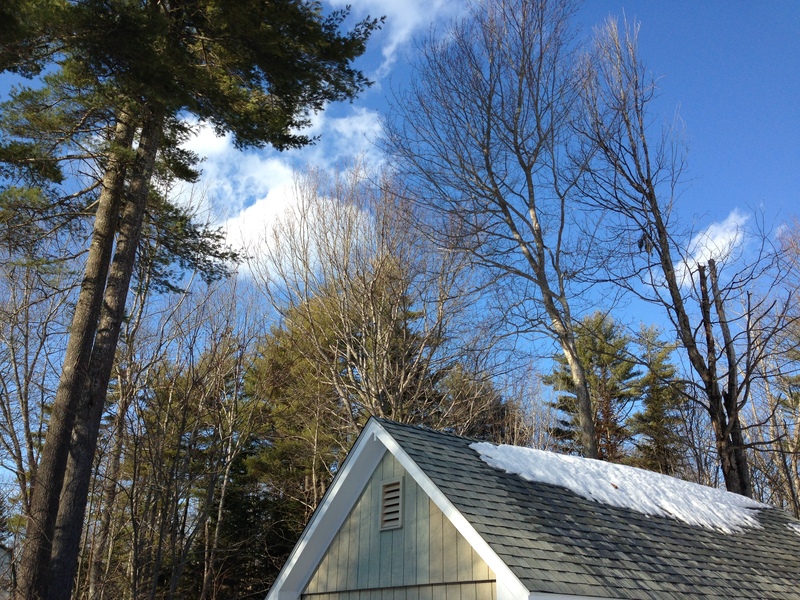 It was a little bit of a tease, because yesterday was a bright and sunny day, and it probably hit 30F or so. But it turned much colder over night and the 25+ mph winds began to blow overnight. 10 degrees F this morning. Ah well. Another paddock view. 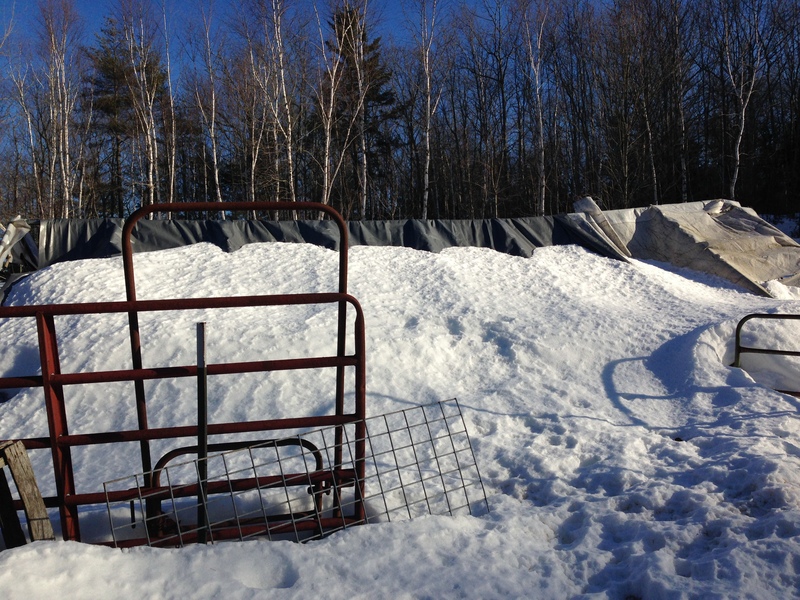 The bunker feeders are not much more exposed than they were last week. Sigh! As I know I have said many times before, we live and die by the weather forecast. My husband and I (plus all the farmers I know) have multiple weather sites bookmarked on our computers and iPads, plus separate weather apps, and consult them regularly. A tab on my browser is permanently set to the 10-day weather so I can click in at any moment and refresh that feed. After Tuesday it looks as though even the nights shouldn’t go much lower than 14-17F, which is a treat indeed. And the daytime temps are coming up. So I will enjoy the daylight, if not the temperatures, but any piece of clothing that we can leave on the rack feels like a little victory over winter! I think it’s time to have a glass of wine and do some knitting. We are back in the throes of winter, with gale force winds and temperatures closing in on the single digits tonight. Sigh. The wind was so gusty last night it kept startling me into sitting up to see what was happening. This morning the news reported spectacular Northern Lights for last night, which we missed (we are usually in bed by 9). Solar flare, I believe. 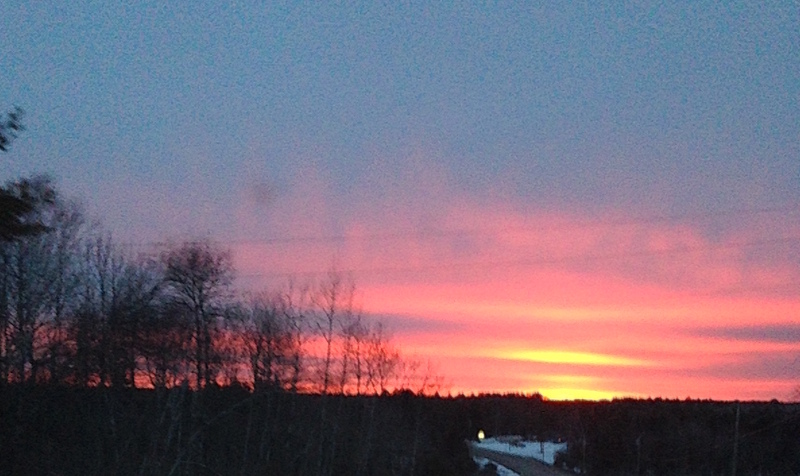 I am sorry to have missed that, but yesterday morning the dawn sky was blazing and had me transfixed. Now if the Northern Lights would just be visible early in the morning right about choretime, I wouldn’t miss a trick! This afternoon. It’s a miracle! Naked driveway! (Today and the driveway awhile back). We can finally see the driveway! It was beginning to feel like it would never happen. 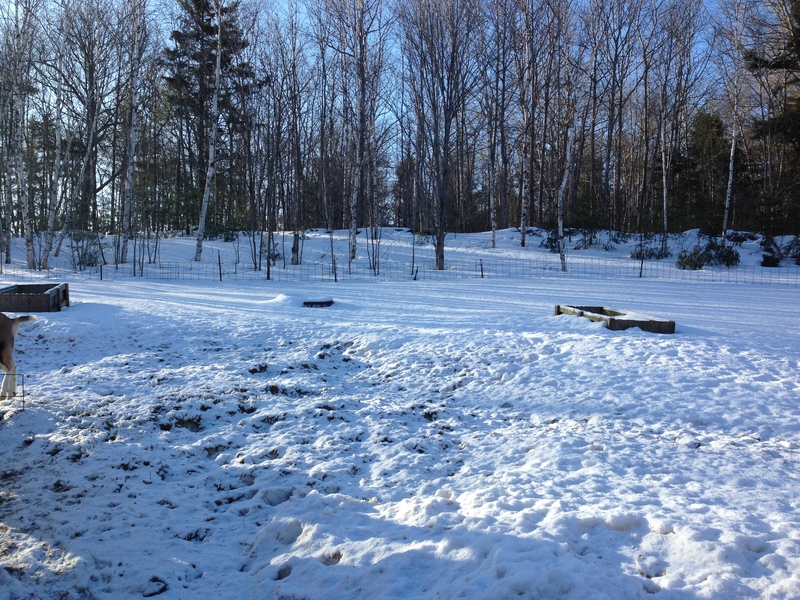 We got a bit of mushy snow on Sunday, but nothing very serious. Then yesterday, late in the afternoon, the temperature plummeted and the winds whipped in and kept going. 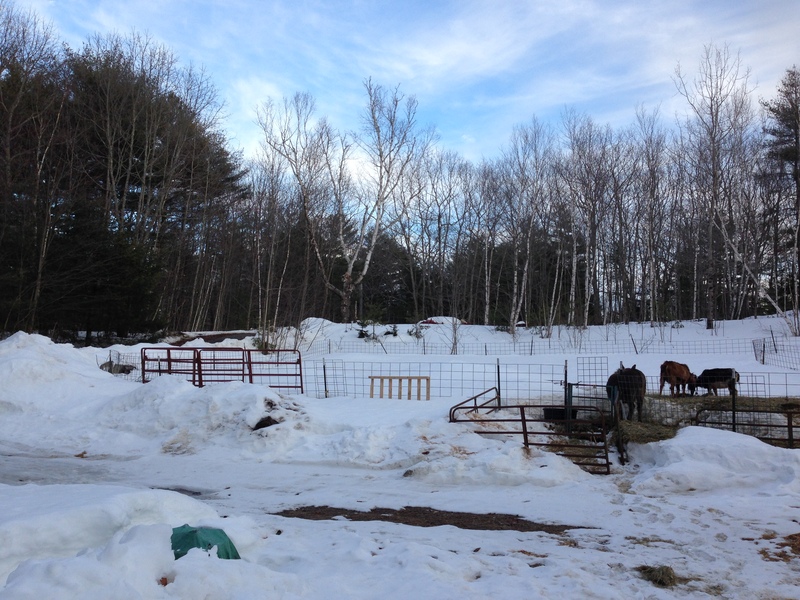 This morning saw 14F around choretime at 5 a.m., and this afternoon it hit 40F. And the sun felt amazing! 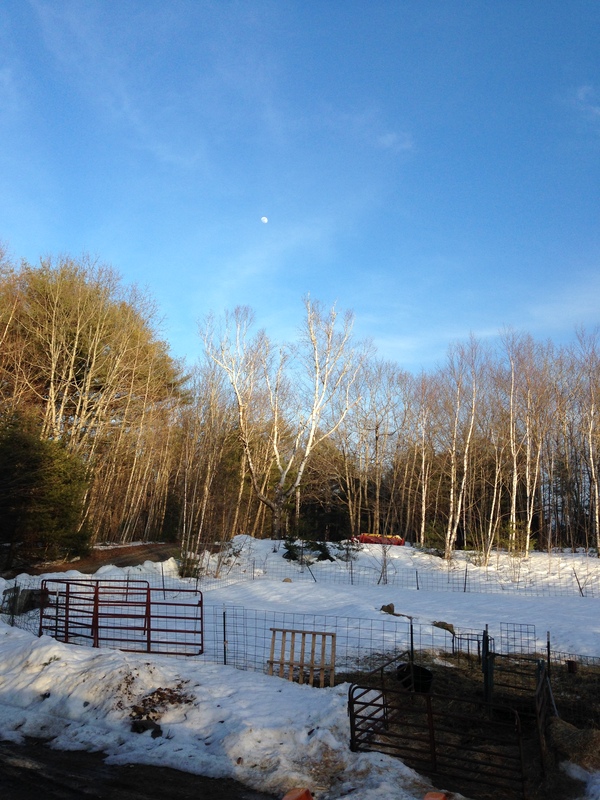 I know that we are on the upswing now, I am enjoying the early mornings doing chores since the time change: lots of dark sky and stars, the big dipper very visible in the sky above the trees that ring our paddocks. 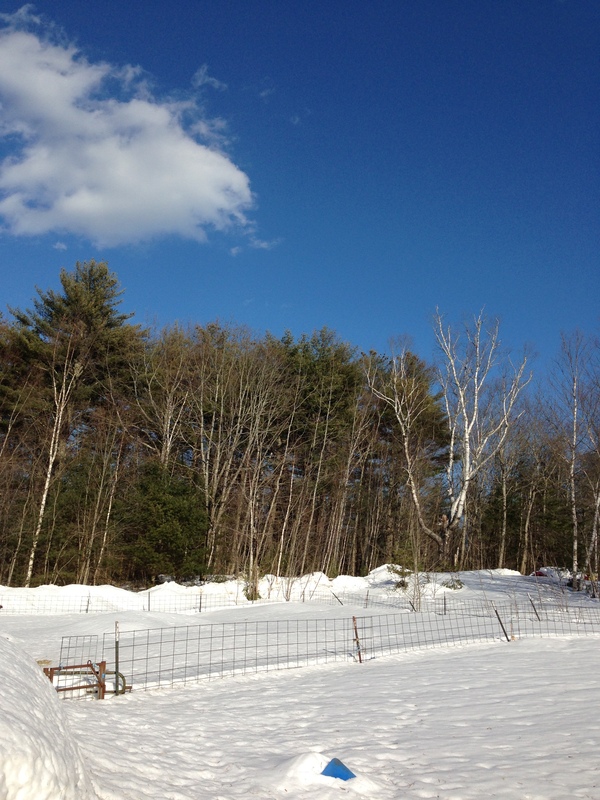 And by the end of the day, warm sun, melting snow, and lots of afternoon daylight. I will be cursing the mud soon, but right now it sounds lovelier than anything. We still have some colder nights to go in the next week, but any day it hits 30F is a winner in my book. 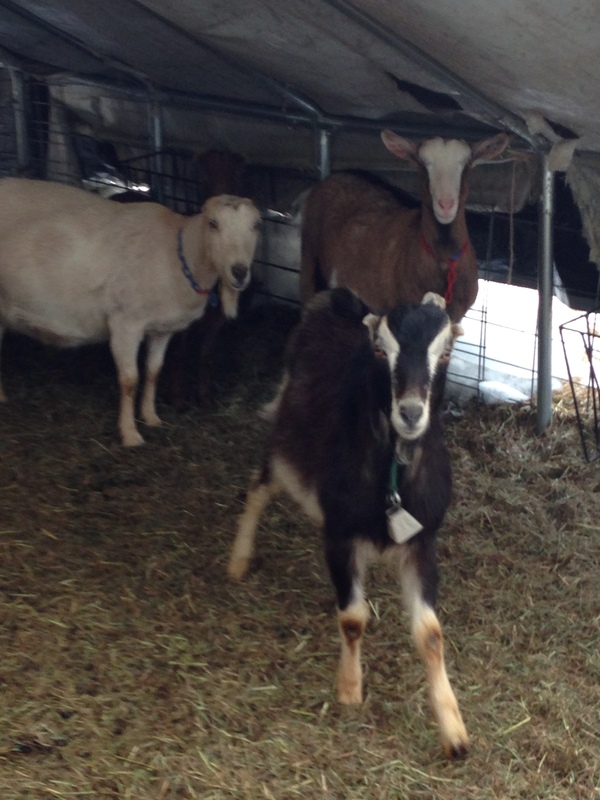 The goaties, Jingle the Donkey, Zorro the Llama and I are giving it a big old thumbs-up! Spring is coming for sure. 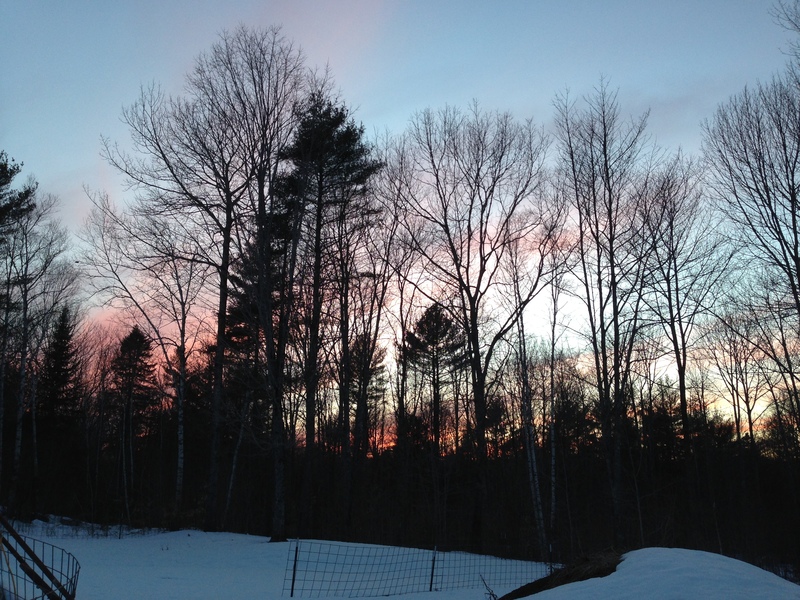 Winter is still hanging on, as it will do in New England. However, yesterday was such a blissfully soft, warm day I stayed out in it as long as I was able to after work. The breezes were gentle and smelled very sweet. We knew it was going to get cold last night, and those Canadian winds blasted out of the northwest and fulfilled their promise. The snow that had been melting is now ridged and hard again, icy and slick underfoot. But that’s okay, we are still one step closer to spring! More snow is forecast for Saturday night and Sunday. Here’s hoping it doesn’t amount to much! I can really get used to those warmer breezes. 50F yesterday was a little taste of paradise! Boys on the snow hill! Amazing days! 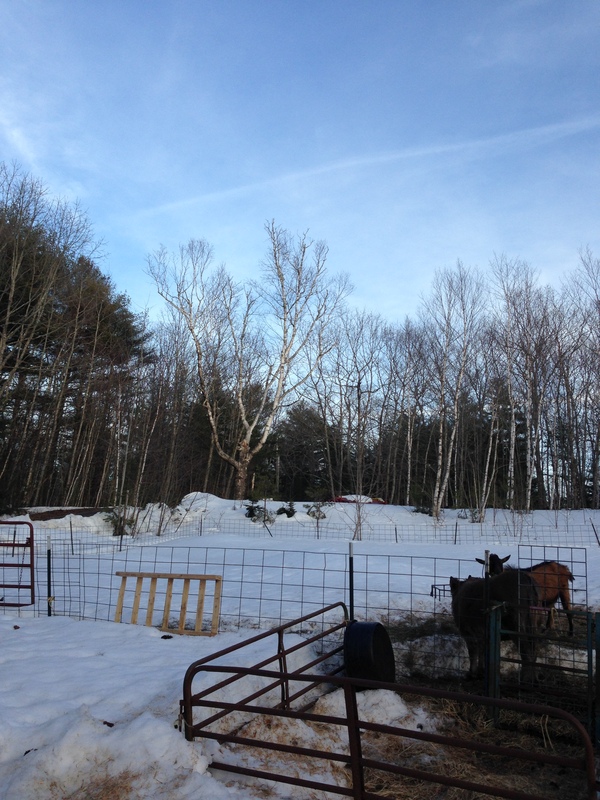 I am seeing patches of hay on the ground that have not been visible in months :*) I am beginning to think we might see a few patches of gravel driveway by the end of the day tomorrow as well. What a relief! 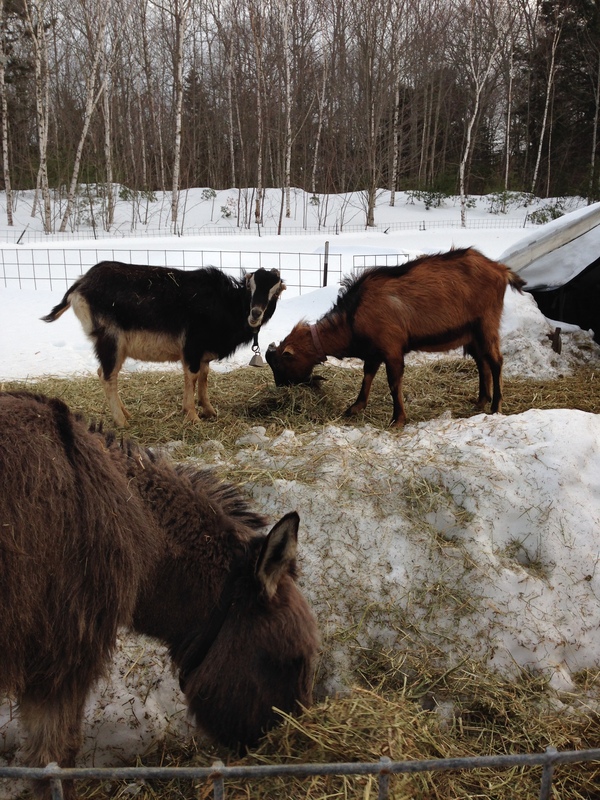 The goats are enjoying being out of their little greenhouse/snow cave during the day, and at some point very soon their little hooves should be touching the ground, not standing in snow. Phew! Between Daylight Savings time and the deliciously warm temperatures, I am doing the Happy Dance of Spring. I am also very glad to be feeling better and back to work this week. It’s time! If we hit 50F tomorrow as advertised, it will be an afternoon for celebration. Definitely.